Fewer than one in 20 local authority vehicles are eco-friendly electric or hybrid models, new figures show. Electric cars outsold fossil fuel-powered ones in Norway last month. Housing associations have received half-a-million pounds in funding for electric hire car clubs to allow people to rent low-emission vehicles. Every new Honda car sold in Europe will be electrified by 2025, the Japanese manufacturer has announced. Store closure plans by electric car manufacturer Tesla have raised questions about the future of its sites in the UK and Ireland. More UK car plants could close because manufacturers want to build electric cars elsewhere, an industry expert has claimed. A “smart” system for charging electric vehicles on the street has been launched to boost the take-up of clean cars. A prestigious Car of the Year award has been given to an electric vehicle (EV) for the first time. Uber fares in London will be increased from Wednesday to help drivers buy electric cars. 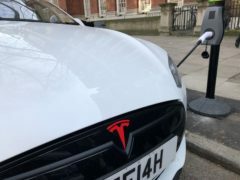 The “honeymoon period is over” for electric vehicle (EV) owners after the city council revealed it will start charging them to plug in their cars. Three of Dundee’s multi-storey car parks will soon host 60 additional electric car charging points, the council’s electric car advocacy scheme has revealed. The cost of charging electric vehicles could be reduced under proposals set out by the electricity market regulator. Dundee's drive towards getting more electric vehicles on the city’s streets has received a boost with the opening of new £330,000 charging points. The first time I got the chance to test drive an electric vehicle in Dundee, I didn’t know what to expect. Dundee has two of the most-used car charging points in Scotland. Dundee City Council plans to create a car park solely for electric vehicles in the city centre. One of the very first new models of the Nissan Leaf electric car has arrived in Dundee, leaving impressed locals in its eco-friendly wake. A group of Welsh civil servants visited Dundee yesterday to find out about the city’s electric vehicle initiative. Dundee is leading the charge in electric vehicle sales compared to other areas of Scotland, new figures have revealed. Entrepreneur Sir James Dyson has revealed his company has been developing an electric car for the last two years.